Pete and Nancy Toennies could not join us for our golf round celebrating our thirty-third anniversary yesterday. They have a dog named Cody who is in the last round of living. Pete and Nancy are in the process of making the “when?” decision, one of the most difficult decisions i have had to make twice and is a driving reason for us not having a dog until i am confident the dog will outlive me: i don’t ever, ever want to make that decision and live through the consequences again. We did go out for dinner with the Toennies last night, eating at a tony Coronado restaurant on the outside patio. I feel deeply for Pete and Nancy in their dilemma . In their golfing absence, we were joined by Mark and Andy, two young Navy Surface Warfare Officers. Mark is the “OE” division officer and the Network Security Officer aboard the USS Milwaukee (LCS 5) (i think that is right: i apologize Mark, for my bad memory; i will correct this when we run into each other again if i got it wrong). Neither of Mark’s billets nor his class of ship was around when i was on ships. Mark played baseball for Penn State. His golf game reminded me of mine years ago except his game is much, much longer. i told him of this driver i had in the late 1980’s. It had a graphite head and a graphite shaft. My friends named it “The Scud Driver,” Like the missile the Iranians had around that time, my tee balls hit with that driver would go a long way, but no one knew where they would land. Andrew is the weapons officer aboard the USS Germantown (LSD 42), home ported in Sasebo, Japan. Her class of Landing Ship Dock ships is the successor to the Anchorage class. i was First Lieutenant aboard the Anchorage (LSD 36). My favorite Navy tour was that job on that ship. She is where i grew into being a mariner. The weapons officer aboard Anchorage worked for me. Andrew played baseball for Concordia University, a small university in Nebraska. Andrew is from near Galveston, Texas, and is a big Texas A&M fan. Of course, i was the senior Navy officer at the NROTC Unit at Texas A&M from 1976 to 1979, one of my two Navy shore tours. Like Mark, Andrew has a lot of potential as a golfer. We might get in nine holes before he finishes his two-weeks of training here and heads back to Sasebo Saturday. Sasebo is one of my favorite liberty ports of all time. Mark’s girl friend, Andrea, moved to San Diego from Croatia about six months ago. She rode with Mark for our round. 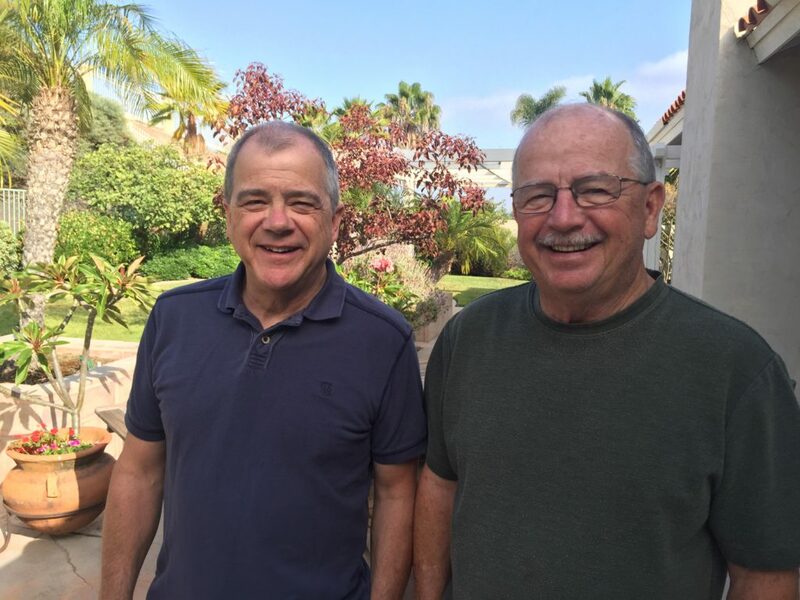 It was good to connect with two young officers who were me almost fifty years ago. i told them a bunch of sea stories, and they seemed to enjoy connecting to the past Navy. It is a different Navy, but it has good folks, and there is always hope when there are good folks involved. The afternoon made me nostalgic. This morning, i opened an email Pete had sent me yesterday. The photo was a reminder of the way the Navy used to be. It also reminded me of my third class midshipman cruise. In 1963, the other ships in the Intrepid (CVS 11) anti-submarine carrier group went to Halifax but the Lloyd Thomas (DD 764) was sent to Sydney, Nova Scotia for Canada’s Independence Day (July 1). In the parade, six midshipmen, including me, escorted the six parade “princesses” through the streets. For a week, we wandered the town, drank a significant amount of Carling Black Label beer (“Hey Mabel, Black Label”), and met some nice young ladies. On the last night of liberty, we worked out a plan with the first class midshipman who had the duty. 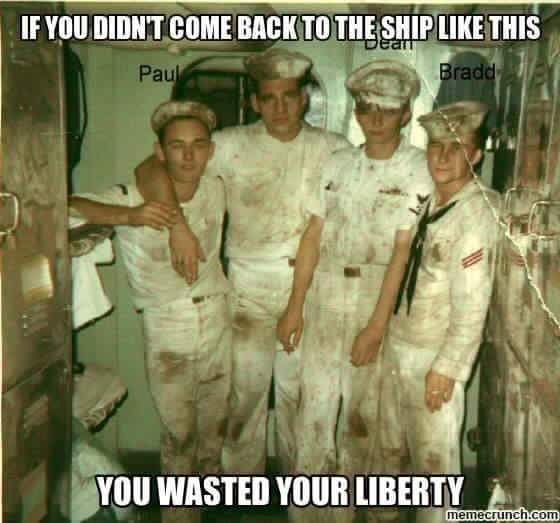 Liberty for seamen, firemen, and third class petty officers expired at 2200. First and Second Class Petty Officers (Acey-Ducey Clubs, remember?) had to be back to the ship by 2300. Liberty for chiefs and the third class midshipmen expired at midnight. Officers could stay out until the next morning. Knowing the first class middie would be the quarterdeck officer of the deck for the midwatch, we worked a deal where he would cover for us and a half-dozen of us could get back as late as 0400 without getting caught. We arranged a party with six of the girls we met at one of their homes on the outskirts of Sidney. It all went well and everyone was having a good time. Then the six midshipmen returned to the ship around 0200 where all hell was breaking loose. Most of the sailors on liberty had gathered at the dance hall in the middle of town. They were dancing with the local girls, and some of the local boys took offense. Around 2030, a fight broke out between a local and a third class petty officer. The fight grew until it became a huge brawl in the middle of downtown. Liberty was cancelled. Shore patrol was beefed up with crew from the duty section, and all hands were ordered back to the ship . The quarterdeck watched was doubled and the executive officer was on the quarterdeck from when news of the fight reached the ship until the captain returned. Wide-eyed from watching the bloody sailors with soiled and torn uniforms (much like in the photograph) straggle back to the ship, we were stunned when we found our first class midshipman was not on the quarterdeck, replaced by a more experienced OOD and the XO. When we reported aboard, we were immediately put on report. We hovered around the quarterdeck watching the sailors return in small groups or one by one. One third class petty officer passed us by after crossing the gangway. His head and arms were splattered with blood, along with his service dress white uniform which was in tatters. He was obviously very drunk and without his dixie shop (sailor’s cap). We were further surprised when we learned the captain had not returned. He had been a submarine commanding officer before becoming the captain of the Lloyd Thomas and preferred going on liberty with the chiefs rather than the officers. Finally around 0315, his sedan pulled onto the pier. As the executive officer walked to meet him, the captain, being held up and helped aboard by the chiefs, reeled across the brow, obviously four sheets to the wind. He and his chiefs had been to a hole in the wall and been tossing them down since early evening unaware of the brawl or liberty being cancelled. Of course, the XO immediately nixed that and helped the captain, with the aid of the chiefs, to his cabin. At 0800 the next morning, the Lloyd Thomas got underway. The foggy harbor area was thick with small vessels at anchor including several Japanese fishing ships. The captain took the conn and was giving orders to the helm and lee helm, obviously a little woozy from the previous evening’s activity. He sped up to standard speed too early and turned to starboard a little late, scraping the side of one of the Japanese fishing ships. Looking down from the signal bridge, my watch station for sea detail, i watched a half-dozen or so Japanese fisherman jumping, diving, or falling into the water. We continued out of the channel to rendezvous with the Intrepid and her other escorts. The midshipmen, including me, received ten hours of extra duty for missing liberty expiration. My ten hours of extra duty was spent mostly cleaning and painting hot, dank, and out of the way spaces. i was told the State department had sent a letter of apology to Nova Scotia and Japan, but all concern apparently ended there. The captain, then a commander, made captain. The incident, including the collision at sea, did not hamper his career. He did not give himself or his chiefs any extra duty. Yep, it ain’t the same Navy. Perhaps, perhaps, the new Navy is better. It is certainly less boisterous. i’m glad i was in the old Navy. Thirty-three years ago on a day like today though much less humid, a sea breeze reached the house on the corner lot where Taft Street intersects with Hughes Street. The temperature in the afternoon reached 95. The backyard of the house was spotted with one white pavilion tent and about a half-dozen serving stations. The wedding took place in the northwest section of the backyard, Reverend Joe Jewell presiding. We are here today to celebrate a union. Maureen and Jim have traveled different paths to meet at the opportune place to become a perfect union. Their love began as a friendship and has grown far beyond what either had dreamed possible. Their wish today to be a celebration, a joyous day of laughter and warmth; they wish to share their elation of finding each other with those here today. They hope the emotion of gladness they feel will overflow and others can feel the wonderment and peace of togetherness they share. The light of love lit by Jim and Maureen has allowed them insight into previously unseen corners of their lives and to see down corridors of their future. This light also has revealed a depth of emotion that defies explanation. It has cast the light of clarity on relations with other people important in their lives, redefining and deepening those relationships. In their relationship with each other, this light of love has allowed them to experience a depth of feeling coexisting with an openness and sharing they have not attained before. This union does not create walls but invites freedom to Maureen and Jim to be who they are with each other and with others with whom they have shared. This wedding is a symbol, an announcement, a consecration of a relationship that has been blessed as a union by the spirit and power that transcends us all. Jim and Maureen, do you promised to share your joy, your insights, and moments of beauty with each other? Do you promise to support each other without inhibitions or reservation in all of your endeavors and moments of reflection, both high and low? Will you continue to hold each other close in body and spirit? And do you promise your friendship with each other, from which this love has grown, will continue with the same openness, depth, and fervor as it began? This ring is a permanent symbol of this union. It signifies the love, adoration, and friendship between these two people. Its never ending circle is a symbol of the extent of Jim and Maureen’s love. It should be remembered the ring is a symbol and cannot completely capture or represent the love and commitment these two share with each other. The lord bless you and keep you; the lord let his face shine upon you and give you peace. When i reread and copied those vows today, i kept thinking about how gracious my brother was in reading them without at least chuckling. But he delivered the words with feeling. It is a bit smarmy in parts and a bit overblown. The writer and editor were in love and wanted to share that with all of their relatives and friends. So i think that is perfectly fine. The above photo is sort of perfect. 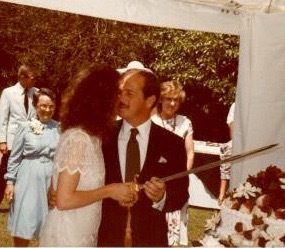 We are cutting the cake covered with chocolate covered strawberries with my Navy sword. My mother is in the background to the left of Maureen. We have now been married for more than half of Maureen’s life. That is amazing to me. i often think it was good to have married each other later in life than most. i think it makes us more tolerant of each other and with the other people we hold dear. We have settled (somewhat) into our routines of an aged relationship. The length pales into comparison to my parents’ seventy-five years of marriage. Still i think our length of marriage shows our staying power and it’s just fine, just fine. And i, as i have pointed out a grunch of times, am a lucky man, a very lucky man and have been so for thirty-three years. the sea becomes your mother, your ingénue, your wife. i read the email and felt numb, all over numb. Then i was confused because i could not figure out how much of the hurt was because i had not done what i had promised myself to do. Every one i have known looked up to Jimmy Smith. He, John Sweatt, and Kent Russ took care of me at Heights and beyond. Jimmy and Kent were instrumental in getting me to pledge Kappa Sigma at Vanderbilt where i forged some of the strongest friendships i’ve ever had and many remaining so today. 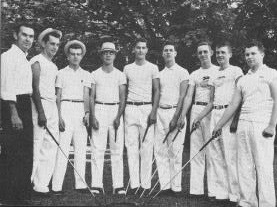 Tiger golf team, 1958: Burke Herron, John Castro, Billy Lea, Bill Rose, Jimmy Smith, Charlie Teasley, Bob Pinkerton, Charles Gilbert, Tom Goldsby. Jimmy was just flat something special. At Heights, he played on the last golf team (1958, i believe). He exuded cool, which was a difficult thing to do in the school’s military uniform. Jimmy and Leonard Bradley are the only two guys i remember who could pull that off. And Jimmy excelled. In everything. Graduating my freshman year, he was the 1959 class salutatorian. Then Jimmy and Kent Russ went to Vanderbilt. Three years later i followed. The summer before i matriculated, Jimmy invited me to a Kappa Sigma summer party. It was not pretty. i drank rum and coke for the first (and last) time, drank more, and blew lunch somewhere. It should have given me a clue, but it didn’t. When classes began, there was no question what i would pledge, and to this day, i’m glad Jimmy and Kent influenced my being a Kappa Sigma pledge. My closeness to my brothers remains strong and good. Both of them watched over me that freshman year and tried to help me as much as possible, but i was on an inevitable course to failure. Even as my grades slid and my acumen for calculus vanished, i still thought i could do everything, including partying hard, sleeping late, skipping classes and still bring my grades up. It didn’t happen, but it wasn’t because of Jimmy and Kent. At Vandy, everyone knew Jimmy as one of the coolest guys around. His favorite phrase was addressing everyone he liked as “fat man.” It became such a deal, he was known as “Fat Man,” and that was a cool thing. He impressed me in everything he did. He was an immaculate dresser, never overdressed, never underdressed. And just as he did in his Heights uniform, he made everything look cool. Jimmy hung out often as The Sportsman Club to the west of the Parthenon in Centennial Park across West End from Vanderbilt. The cool guys hung out there. Of course. In the spring, Jimmy invited me and another freshman (i think it was Cy Fraser) over to his apartment, where we drank scotch. i was not a scotch drinker, but Jimmy drank scotch so i thought it was cool and drank it that night. Then he put on a record. The artist remains one of my all time favorites. It was Mose Allison singing on all the tracks of “Mose Allison Sings.” i listened with awe. I fancied myself a blues fan, and obviously, Mose has some of that in his songs, but it was different, jazz, cool, just like the Fat Man. i later learned it was also the first album where Mose was allowed to sing on all of the tracks. Jimmy knew. He was that cool. Jimmy left for Virginia law school after that year, and i never saw him again. Through my Lebanon, Heights, and Vandy contacts, i kept loose track of him, and knew he had become a prominent labor and contract attorney in Atlanta. i also learned through either John Sweatt or Earl Major or both, Jimmy had lost his vision in his later years. The Fat Man was an inspiration to me. i always wanted to be like him. He was the coolest, but he also was one of the most genuine friends i ever had. After learning he was in Atlanta, i vowed to get his contact information, call, and even planned how i would go spend an afternoon or a dinner with him. i’m sure if i had, i would have more memories of how cool, intelligent, genuine, and funny he was. But i was thwarted in my initial efforts to contact him, usually being called away from my quest for some immediate crisis. The item on my checklist kept getting pushed down the page. i am terribly sorry i was not more tenacious. i hurt from his loss because he meant so much to me. i hurt even more because i did not spend more time with him. i guess what i’m really trying to say is: if you have a friend who is special to you but with whom you haven’t communicated in a long time, don’t put it off. Find them, call them, visit them. If you do, i don’t think you will hurt as much as i am hurting right now. Rest in peace, Fat Man. can’t imagine school in july. am i watching sesame street? does the boy want to be oscar the grouch, kermit the frog? i had shown up with green hair. where did those girls i worshipped go? As with all things, one (as in this one, aka me) should not get frustrated when there is a detour in the road. It might lead to something beautiful. Yesterday, i had several important tasks, administrative and physical to get done at home. The first one was to get our home phone line and wireless remote sets working correctly. i went to the corner of my office bookcase next to the window. One of our indoor cats (we are pretty sure it was the male, Bruce Willis) had peed in the corner, a repeat performance). So, instead of working on the telephone problem, i began to clean up the mess, including the telephone and electrical cords hidden in that corner, and Maureen and i began planning a strategy to stop Brucie (Maureen’s loving title for the boy) from repeatiing this foul deed again…forever (i know a cure, but PETA would hang me from the yardarm, and i couldn’t do it anyway). Then, i wondered what damage had been done back of the bookcase. Now, this bookcase with the storage areas on the bottom rises to my office ceiling and runs almost the length of the wall. i’m not going to just slide it out. Oh no. i must take out the books to move it. i take out the books and pile them on a folding table and the dining room table, each pile rising to about three feet. i slide the bookcase from the wall, clean up the mess, and spray cat pee repellent for a temporary fix. i go to Home Depot — i cannot think of a home task i’ve done in the last twenty years or more that didn’t require a trip to Home Depot, Lowe’s, Office Depot, the drug store, or the liquor store — to get a new telephone wire. i move the bookcase back even though when i moved it out, i found several other tasks that should be done, like replacing two baseboards and painting the wall, which would lead to painting all of the walls and baseboards, which would create the need to move pictures and wall hangings to new places, to sorting through a lot of memorabilia, keeping a few out and adding the others to boxes of memorabilia, which would lead to reorganizing all of Maureen’s and my memorabilia, which includes her father’s, my parent’s, aunt’s, grandmother’s, and other family member’s stuff…ad infinitum. So i decided i would just put the bookshelf back and reload it with the books so Maureen would not be upset with a pile of books spoiling her beautiful dining room’s appearance. By that time, it was time to watch a baseball game. Fittingly, the Padres lost both games in the double header to the Cardinals. This morning, i began returning the books. i found a few that needed a new home. Then i came upon one that puzzled me. It was a 8 1/2 x 11 inches bound book entitled Uncovered Dreams from “The International Library of Poetry.” There was no handwritten inscription inside. The copyright year was 2002. i remained puzzled when i spotted a 3×5 index card inserted almost completely in between pages 62 and 63, with one end barely sticking out, a bookmark. Scanning the 16 poems there, i finally saw the reason i had for keeping this book. “Lost Hope” was there, the sixth poem on page 62. It was written by Sarah May Jewell. There had been a promotional appearing to be a poetry competition for middle school students. We entered Sarah’s poem. i had forgotten. Then i read the poem, again although it had been over 15 years since i had read it before. i have always claimed my sister-in-law, Carla Neggers; my brother, Joe; and my two daughters, Blythe and Sarah could write rings around me. Carla, Joe, and Blythe are published. You can read their stuff, Carla’s new book, Keeper’s Reach, will be out next Tuesday. Joe’s book, The Elements of Prayer: Learning to Pray in Real LIfe, is a spiritual guide for me. Blythe’s book, Something Smells Like Pee, is a funny, poignant book of poems you can enjoy. And Sarah, i remembered is published too. The kind that makes you cringe. Thinking it’s all a joke. And times when you are in deep rest. She wrote this when she was 13.
i have proved my point about those four writing better than me. It is time to complete refilling the bookcase. This was originally written in 2009 and revised last night. To me, it was sad then and even sadder now. i am amazed we have created a system of two groups of political lemmings. i am amazed at the vitriolic, poisoned, and untruthful slime these two groups of lemmings throw at each other. Quit trying to be funny by spreading BS, or worse just passing it on. Our system is broken and spitting venom from either side is not going to make it better. We need to take appropriate and effective action to wipe out those who would destroy innocent people and our system, but putting good folks in the same category as the bad ones — and i don’t care which group is categorizing and which group is being categorized — is not the answer. In fact, it’s the opposite of the answer. Okay folks of the good ole US of A, get real. i don’t think we can. The flying experience takes many twists and turns. If one can keep his wits and not dwell on the inconvenience and lack of customer service, it can be an entertainment medium through watching the characters. In the long lines and mostly ineffective security measures employed in San Diego, i embarked on this business trip today. Even before i got on the flight, i witnessed a montage of characters that would have fit well into a novel of international intrigue. Amidst the seasoned travelers, trying to act like they were seasoned while still perplexed at the continuing change in rules, regulations and procedures, and the wide-eyed questioning new air travelers, i found my way to the Delta counter. A tall, slender Muslim woman was at the next counter to the automatic ticket processing, which i have come to use rather than the redcaps. She wore a head-to-toe black veil that was attached across her face at the left ear. While checking in, she unattached the veil in order for the counter personnel and, later the TSA security guards match her identification with her features. “Ahh, i wondered with no malice, “i wonder what Allah thinks about this particular waiver for progress?” While going through these checks, she would demurely hold the garment across her nose with her graceful slender fingers of her right and touching the lobe of her left ear. When requested, she would open out the veil just enough for the evaluator to see that the face did indeed match the photo on the plastic card. After each check to see if she was really who she really was, she would reattach the veil so it would drape across her face of its own accord. From my vantage points, this semi-permanent visage reminded me of the “Black Bart” characters in the black and white western movies of my youth – Oh Hoppy, where have you gone? For me, the veil enhanced her allure. The floor length garment was of fine material and it flowed elegantly around her slender frame. The garment would occasionally flitter open, revealing a blue and white sheer taffeta gown underneath. The chic, square-toed, black leather and low-heeled shoes slipped out from underneath the black folds when she walked. They strangely fit the image of this mysterious lady. Her eyes were deep, dark and fetching. But in one of those vulnerable moments of identification verification, i caught a brief glimpse of her face. The skin was flawless and matched the beautiful eyes. The nose, however, was long and hooked, ill fitting, and it shattered my illusion of her allure. That is not to say she was not beautiful to some. i recognized my prejudice in such a judgment and chastised myself. Later while waiting for our aisle numbers to be included in the boarding process, a well dressed lady with a sharply pulled back pony tail, short sleeve sweater, and slacks passed the Muslim lady while moving toward the boarding pass screening. She looked directly at the lady of the veil. Her look was a combination of loathing and fear. Inexplicably, she made the traditional Catholic sign of the cross gesture and moved quickly away. i felt sad and powerless. It struck me we, all of us, at our core are mean people. We fear things we don’t know or understand, and it’s even worse if those things are people. i did not try and change the woman with the pony tail. i never talked to either her or the veiled lady. i realized it would be fruitless. Today, the differences are even more pronounced. Evil has reared its head in an even worse form than before when this piece was originally written seven years ago. And we have taken sides, and our sides are blind to the humanity of the majority of those we label as enemies. i have friends who actually take a stronger stance against Muslims than the Republican presidential candidate. Nearly all are military men, like me, and the art of killing in defense of our constitution is part and partial of the mission we served. That is what we were trained to do. But i cannot go along with even Trump’s proposed draconian position on Muslims. Didn’t we learn from WWII, the Civil War, and the history of settling this country? People are people. There are good ones; there are bad ones; there are those in between; and there are evil ones. And that goes for those in all religions, all races, all countries. i don’t claim to have an answer, but surely, some men and women in positions of power can come up with a better answer than hate. He and Carla left yesterday morning, pulling out of our driveway and driving down the street headed for the airport. When people i care about depart or i leave them, there is an emptiness i feel. In this case, it’s right silly of course. i will see him and his wife again, probably, hopefully quite a few times here and there for the rest of our lives. But you see i had him for me for three days. Of course, Maureen was around for most of that time, and Carla joined us before and after the Romance Writer’s Association annual conference in downtown San Diego. Our time with Carla was way too short. She is a wonderful writer, woman, mother, and grandmother, and as smart as anyone i’ve ever met. Two nights and parts of three other days were not enough. But those three days with my brother were some of the best i’ve had in a while. My brother Joe is five years younger than me. i sometimes like to think his observing his older brother behaving like a locomotive going down the track without an engineer might have given him a lot more sense than his older brother. Joe read the World Book Encyclopedia before going to Castle Heights, and my memory says it was before attending Lebanon Junior High. i mean the whole thing he read. He was spent his youth learning automobiles from our father, reading continuously, learning from his teachers, exploring, camping, and avoiding anything he saw his brother beat himself up trying to accomplish, like biking and water skiing. That is to say, Joe had some sense; his brother not so much. Both earned scholarships to Vanderbilt. The resemblance stopped there. Joe graduated, earned two masters at Boston University, became a minister of high moral and ethical standing, and delivered powerful, thoughtful sermons. He married and remains married to the successful and widely read Carla Neggers, having a son and daughter, and now has three grandchildren. Except for several annual trips to Ireland, vacations in Florida, returning home to Lebanon, Tennessee, and several other escapes, he has lived in New England, albeit bouncing around in that area of the country quite a bit, since leaving 127 Castle Heights Avenue in 1971. He can write like nobody’s business. He wrote an inspirational book on prayer, The Elements of Prayer. His weekly articles in his church’s newsletter while he served in Springfield, Vermont, are some of the best writing i have ever read anywhere. A retired minister in Vermont. He made the decision to retire completely and enjoy his life with his wife, his daughter, son, and son-in-law, and his grandchildren. He does. His brother, aka me, blew out of Vanderbilt like a falling leaf: bad choice of majors, lots of partying, and not much studying. Finally getting his degree from Middle Tennessee, he escaped the draft by going to Navy OCS, getting out after his initial obligation, writing sports in Watertown, New York, getting back in the Navy, wandering around the country and world until he completed active duty, has had about a dozen jobs since then, and to some degree is still working. aka me was married twice before the third one stuck. By the way, he, aka me, wouldn’t change a thing because his life has produced an incredible forever wife, two talented, lovely, and caring daughters, and a grandson with unlimited potential. So we’ve got this wise man who was a preacher, a Christian, in the Northeast, and this goofy guy who was an officer on fighting ships in the Southwest, about as far away as two could get in careers and location. It is sometimes scary how much we are both alike. While here, after Maureen had retired for the evening, or when we had moments with just the two of us, we talked a lot; or rather, i talked a lot; Joe talked when needed. One late night (for old men), i was sitting in my chair and Joe was sitting on the couch while we watched baseball on television. i could not help but think of other late nights when the others had gone to bed. My father would lean back in his recliner while i lay on the couch, and we watched baseball. As Joe and i talked, i kept thinking he had the same experience with my father as i did, as he and i were sharing at that moment. In our case, it seemed to me we kept switching roles. i wondered if Joe made the same connection. i hope he did, but i never asked. He’s gone now. With Carla, he flew back to Boston and drove back to Vermont yesterday. In case you haven’t already figured it out, i admire my brother. Immensely. But more so, i love him. i ask his advice. i heed his counsel. i am overjoyed at his success. i have a lot of close friends, buddies. He and i have a wonderful sister who should have been with us this past week. For you see, Joe and Martha are my best friends. There is an empty spot, actually two this morning at the breakfast table. Life goes on. Joe and i were meant to be about as far away as anyone can get and stay in this country. i read it in yesterday’s Union-Tribune “Off the Wall” section of the sports pages. i wish i hadn’t. With all of the insanity going on in this world; my inability to vote for a presidential candidate of any merit; other serious, even scary stuff going on, i scan and then skip the news sections of my paper and go to the comics and the sports section. But after yesterday, i will have to scan my sports page content before reading. Yesterday, “Off the Wall” reported Joe Frazier’s jock strap (athletic supporter, if you wish to be politically correct) is being auctioned off. The bidding has begun on the internet and someone (i’m not sure i would label anyone who placed a bid as “someone” since that implies there is a brain in there somewhere) has already made the opening bid of $5,000. Joe’s jock that protected his privates while he beat Ali in “The Fight of the Century” in Madison Square Garden is expected to be sold for more than $10,000. Not believing this or even wanting to know it, i still did a search on the internet. On the TMZ sports website, i found that not only Joe’s manhood protector was on auction, but that the jock strap Nolan Ryan wore when he pitched his seventh no-hitter was sold several years ago for $25,000. My biggest question is what the hell would you do with a jock strap you bought for $25,000 or $10,000? Frame it in a shadow box and hang it in your living room? Have it bronzed and use it for a front door knocker? Of course, the scariest possibility is the idiots who spent that much money to get Joe or Nolan’s equipment protector might actually wear them. So yesterday after reading the article, i determined the world is completely out of balance and there is not a damn thing i can do about it. A Pocket of Resistance: Gig ’em! 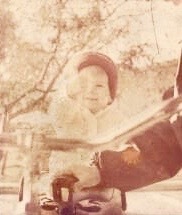 There is this small photo, badly faded, i have kept with me since 1974. It captures a two-year old as a bike rider. She is in a Texas A&M sweater and knit cap, and she is making the Aggie’s “gig ’em” sign with her left hand, her thumb jutting up in the air, with a big smile on her face. i cropped the photo down to fit in a small frame and put it on my fold out desk in my stateroom on the U.S.S. Hollister in Long Beach. i would have put it in the log room, the chief’s engineer’s headquarters on a FRAM destroyer, but i seldom used my desk there because of so many engineers needing access to the space. i did put it in the first lieutenant’s office when i transferred to the U.S.S. Anchorage in March 1975. The smile of the girl in the photo lit up my day every day while my ship was on a seven-month deployment to the Western Pacific. Even before my next tour at Texas A&M, the marriage was unraveling, and i realized i would not be a at-home dad for the girl in the photo. At A&M, the photo was on my desk in the NROTC office. The girl’s smile gave me hope in my darkest hour ever. Then i truly went away. The girl in the photo stayed with her mother in Texas. That was the way things worked in those days. Regardless, i was faced with making a heart-breaking decision because i was determined to do what was best for my daughter regardless of the pain i felt at my loss of being with her every day. From then on, the photo always has been near my desk, wherever that might be. Tonight, it is on the lower hanging shelf above my desk. It is the first thing i see in the morning, and i greet the day with the thought of “Gig ’em.” The photo has always made it easier to take on the day, regardless of the impending good or bad. Ironically, the girl in the photo, one Blythe Jewell Gander, eventually graduated from tu, or the University of Texas, Austin as it is called derisively by the Aggies, and she is not an Aggie fan. i am not wise in the ways of modern photo touchup technology, so this is pretty much the way it looks in my small frame. But it makes no difference for that photo of her smiling with that thumb pointed to the sky makes me smile, and i am ready to get it on every day.